The Papeete Tahiti Temple is the 25th operating temple of The Church of Jesus Christ of Latter-day Saints. 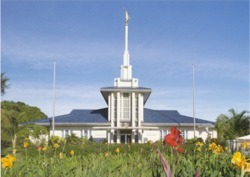 The building of the Papeete Tahiti Mormon Temple was announced on April 2, 1980. Until its completion, members in Tahiti had to travel to New Zealand to attend a temple. There is a lot of Mormon history in French Polynesia. The first Mormon missionaries arrived in 1844. It was the first mission of the Church where missionaries would be teaching in a language other than English. Missionaries were able to find many who wanted to join the Church, but missionary work was stopped in 1852 when the government put restrictions on missionary work. Despite the slow missionary work members in the area remained strong in the gospel and in 1891, the first Mormon meetinghouse was built in Takaroa. It is the oldest Mormon meetinghouse in the South Pacific. In 1892 governmental restrictions were removed and missionary work again went forward in the area. Members in the area have been stalwart and loyal to the Church, and in 1976, President of the Church at the time, Spencer W. Kimball announced that he would travel to Tahiti for a conference. Many Church members traveled days in small boats to attend the conference. One group of fifty people arrived a few days before the conference from the small island of Taenga. At the time, no one thought there were any members on the island. The group explained that the entire population of the island were members and that they had all traveled three days on a small schooner to Tahiti for the conference. Today eight percent of the total population of French Polynesia are members of the Mormon Church. In 2004 a large celebration was held for the 160th anniversary of the Mormon Church in French Polynesia. The Church is strongly supported in the area with many government dignitaries that have thanked members and leaders of the Church for their service to the people. A groundbreaking ceremony and site dedication for the Papeete Tahiti Temple were held on February 13, 1981 with Spencer W. Kimball presiding. The temple was open for tours to the public October 13-22 1983. Those who toured the 9,936 square foot temple were able to see the two ordinance rooms, two sealing rooms, Celestial room, baptistery, and other facilities of the temple used to carry out ordinances according to Mormon beliefs. The temple site is five acres. The exterior of the temple is finished in stucco using imported white sand and the grounds are beautifully landscaped. The Papeete Tahiti Temple was dedicated by Gordon B. Hinckley in multiple sessions held October 27-29, 1983. The temple serves more than 21,000 members of the Mormon Church in six stakes of French Polynesia. After renovations the Tahiti Temple is scheduled to have a second open house October 14-November 4, 2006 and then it will be rededicated on November 12, 2006. Plans are being made to hold a cultural celebration and member meeting the day before the dedicatory services. This page was last edited on 7 December 2010, at 20:13.